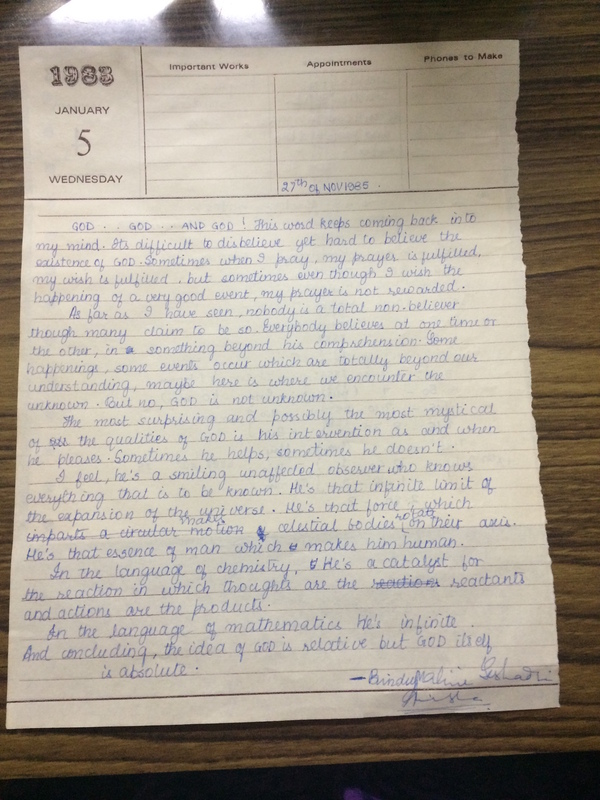 I was rummaging through some old stuff yesterday and came upon this essay that I had written in 1985 on God … its fascinating to meet your 16 year old self at 48. I seem to have very clear ideas on what God is and is not. Interestingly this was written when I had not read a single book of Osho’s nor heard any of his discourses. At 16, I also seemed to have figured out that not all your prayers are fulfilled and that God is quite unaffected by what you are going through. I like myself at 16 and I also realise that I have been a chronicler for a long time … I started writing poetry when I was 8 and I find a lot of essays in between the poems. No wonder I took to blogging like a fish to water. My views on God today ? Well, God is a crutch that we lean on when we refuse to take responsibility for our own life and actions. Guess am exactly sitting on the line that demarcates the Atheists and Theists. Bindu, I like your questioning mind. I like that you refer to God as “it” and not some male authority figure. And, if you like physics, perhaps you’ll like the idea that in our expanding universe, consciousness itself is expanding, reaching so far unimaginable potentialities. You like Osho, while I’m a fan of Seth (Jane Roberts’ series). Seth claims everything has consciousness and he refers to God as “All That Is” to escape the religious connotations. While All That Is is infinite, it allows free will to its creations in order to learn from them. And their thoughts build on themselves to create new worlds–thus the corollary in physics of the expanding universe. Awareness is key, on personal and universal levels, I agree. You mentioned it with your allusion to the citizen being asleep while the politicians run the train over a cliff. Religion & God are great escapes ( illusional or otherwise) for us to deal with our mortality. Somewhere during our evolution, our brain developed to understand about our disturbing mortality. Religion and God were developed to give us the comfort that the” party” continues in heaven after our stint here.